Join on-campus organizations like the Augustana Nursing Students Association (ANSA) that link you to a national network of nurses. The Department is proud to boast 100 percent job placement for the Class of 2017. Read the letter from the department chair. With a Quality and Safety Education (QSEN) grant from the Robert Wood Johnson Foundation and collaboration with nursing education deans and directors, the nursing department at Augustana was one of only 15 schools in a pilot test program designed to improve success of classroom technology (such as the interactive mannequin). Nursing and Spanish major Eric Vander Lee was named South Dakota's top student nurse. Oh, and he's biked across the U.S. for charity. Twice. Read more. Our Parish Nursing Center prepares registered nurses to meet the holistic health needs within a congregation and assists churches who are interested in starting a parish nursing program. Augustana Nursing Department is a member of the South Dakota Chapter of the Institute for Healthcare Improvement (IHI), a 25-year leader in healthcare reform. As part of the curriculum, the Augustana students complete the IHI video modules related to safety, quality improvement, leadership, interprofessional collaboration, and others. Augustana is among the few nursing programs in South Dakota utilizing this nationally-recognized resource. The PIN students are hired to a position that provides an accelerated learning experience for aspiring nurses that is jointly supported by education (Augustana University) and practice (Sanford Health) partners to augment the transition from academia to service. The PIN Student Nurse partners with Augustana Nursing faculty and the Sanford Clinical Nurse Educator (CNE) during the spring semester of the senior years. works closely with the CNE during completion of up to five weeks of medical surgical rotation followed by a base clinical rotation. attends meetings that cover professional nursing-related topics with a focus on building confidence and sound clinical judgment. researches, prepares, and presents nurse-sensitive indicators, and relevant clinical nursing topics. is expected to assess and provide competent, safe care for acute care patients. works collaboratively with other interprofessional team members. has excellent clinical, communication, and clinical judgment skills. The PIN program accepts approximately 8-15 senior nursing students each year. Sanford Internships provide quality, high-learning opportunities for students interested in pursuing a health care-related career. With a passion for redefining health care and transforming lives — the interns gain valuable experience and share in our dedication to making a difference in the lives of patients and team members. For more information and how to apply: Sanford Internship. Professional Development Program (PDP) at Avera McKennan is a summer well spent for students preparing for a career in nursing. Hospital nursing is an exciting career filled with many opportunities for advancement. PDP provides educational and clinical experience for nursing students, enhancing their prioritization, and critical thinking, problem solving and decision-making skills. The program pairs the student with a Registered Nurse mentor in the clinical setting and provides a comprehensive orientation including clinical experiences and a formal case presentation. For more information and how to apply: Avera McKennan PDP. Scholarships for nursing or pre-nursing students who are U.S. citizens or permanent residents and can demonstrate financial need. Scholarships range from $1,000 to $5,000. For more information and how to apply: www.nsna.org. Sanford Health has developed a scholarship program, Heart of Tomorrow Scholarship, to assist an employee's dependent child(ren) ho wishes to pursue post-secondary education in a two- or four-year college, university or vocational/technical program. These scholarships will be offered on a yearly basis for full-time study at any accredited post-secondary institution. For more information and how to apply: Sanford Health Scholarships. Sanford Health Nursing Loan Forgiveness Scholarship program is available at our Sioux Falls location. Sanford Health is offering a financial scholarship to assist nursing students with the expenses associated with the completion of your degree. As a recipient of these resources, you have the opportunity to work at Sanford Health — a healthcare industry leader — as a full-time employee. For more information and how to apply: Sanford Health Scholarships. 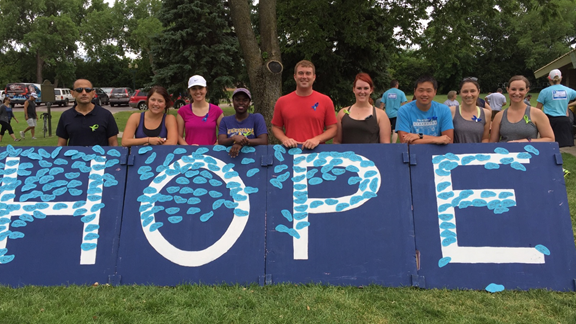 Nine of our AU accelerated track nursing students took part in the Helpline Center's 5th annual Step Forward to Prevent Suicide event on June 18 to help bring awareness to suicide. The Augustana Nursing Students Association (ANSA) connects students to each other and organizes trips to national conferences. Zeta Zeta is the Augustana's chapter of Sigma Theta Tau International, the honor society of nursing.